Have you ever wondered what it’s like to breathe underwater? Are you curious about SCUBA diving, but a bit hesitant about going into the sea? This is for anyone who has never experienced SCUBA before. Using SCUBA, a Self-Contained Underwater Breathing Apparatus, you’ll be able to try and discover what SCUBA diving is all about. TrySCUBA will be the most basic introduction to the underwater world. 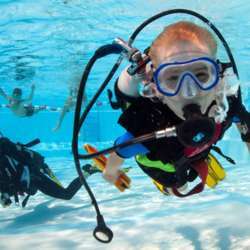 TrySCUBA will give you the opportunity to experience breathing underwater in a pool (confined water) and you’ll learn several dive skills to see if SCUBA diving is for you. This activity will take place on Monday, February 18 @ 20:30 at a pool in Barsbütte, but you will need to get fitted for your size for all the equipment (e.g. BCD, Wetsuit, booties, fins, masks, etc. ), so prior to the days of the activity, we will arrange a time and date to meet to go to the diving shop. Also, the payment must be made on the day of the fitting to guarantee your spot. Further details will be given only to the members who sign-up and make the payment.